Corsair Trail has 28.3 miles of one-way trail that varies from gently rolling, easy terrain to somewhat hilly, most difficult terrain. 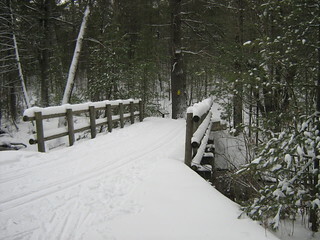 The trails may be hiked anytime during the snow-free periods. The trails are marked with blue diamond-shaped confidence markers. From Silver Valley Trailhead - The portion of trail from this trailhead offers skiing that is gentler and less hilly. There are two Silver Creek bridge crossings on this section. Wrights Lake Trailhead - This portion of the trail provides a little more challenge with longer loops and steeper hills. This trail is groomed. Corsair, Silver Valley and Wrights Lake Trailheads are plowed in winter. Silver Valley and Wrights Lake Trailheads are maintained from Dec. 1, 2015 to Mar. 31, 2016. Corsair Trailhead is maintained year-round. Travel west on M-55 for 1 mile. Turn right and travel north on Wilber Rd. for 1 mile. Turn right on FR 4102. The trailhead is on the right. Access road and/or parking lots are plowed. Water and/or toilet facilities are available. Corsair Trailhead is open year-round. Silver Lake and Wrights Lake Trailheads are gated when closed and no parking is available. parking is gravel, plowed in winter.